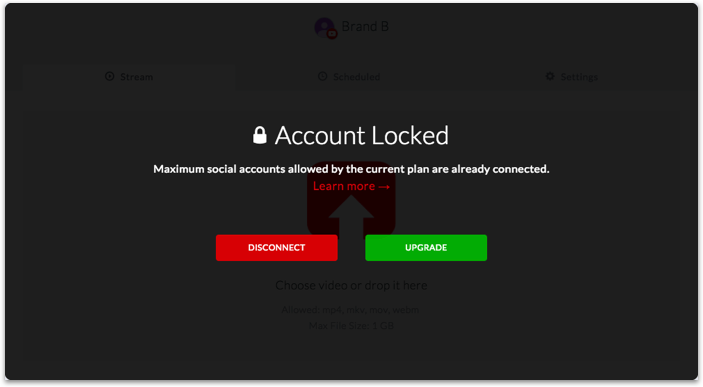 If you decide to downgrade your subscription then the social accounts exceeding the maximum allowed connected accounts limit will be locked automatically. Following message will be displayed. You cannot schedule a stream on a social account that is locked. The system will automatically lock some accounts that exceed the current subscription&apos;s limit. If you want to use a locked account, you first need to disconnect an existing connected account, then disconnect the locked account and add it again. Check pricing info. You can upgrade the plan to unlock the connected social account. To upgrade click the UPGRADE button. If the locked social account is not required any more, you can simply disconnect it from OneStream by clicking the DISCONNECT button. Please remember, any scheduled live stream will also be deleted after you disconnect the social account.